Greek, probably eastern Greece/Rhodes, late Archaic period, ca. early 6th century BCE. 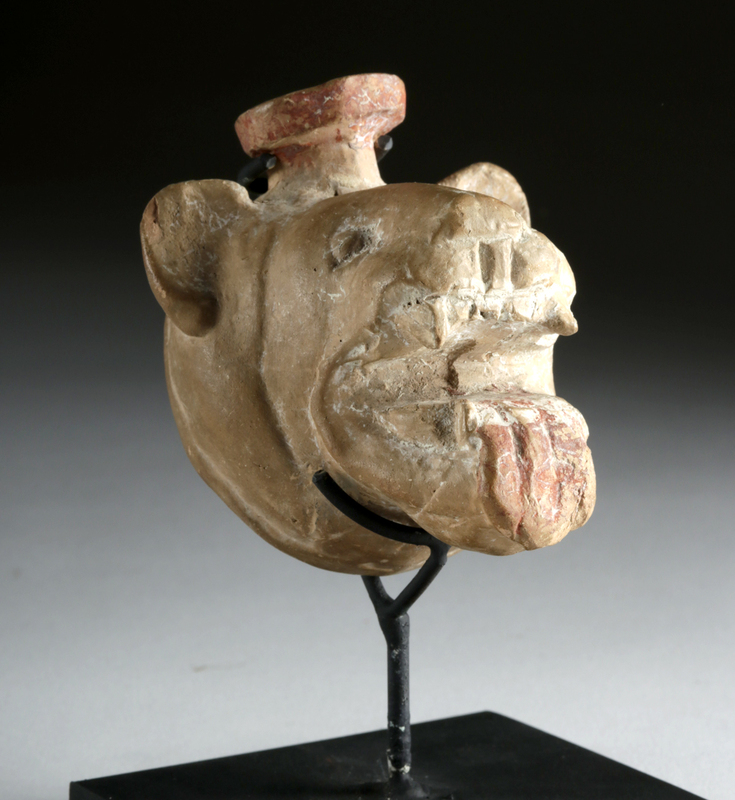 A dramatic aryballos in the shape of a lioness's snarling head, complete with wide open mouth and protruding tongue, small eyes and powerful snout, and small, pointed ears with a very narrow, wide-mouthed spout between them. The tongue and spout are bright red, while the rest of the head is a pale brown. An aryballos is a vessel with a small, round/ovoid body and a narrow neck terminating in a slightly flared, very narrow spout. The broad, flat lip is designed to prevent spillage. 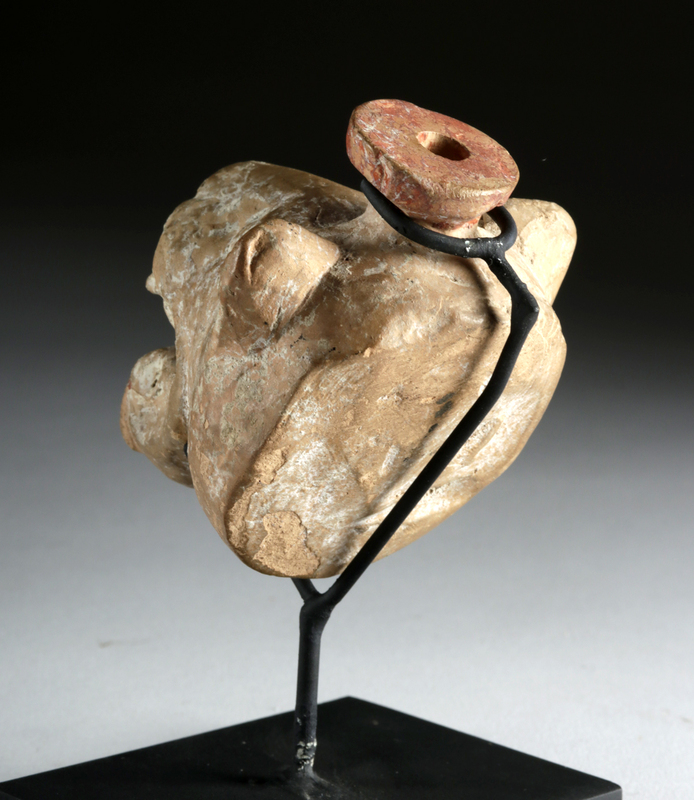 We know this object is from eastern Greece because of its unique shape: animals, warriors' heads, and other mold-made figures became the body of aryballoi in this area. This would have served as a container for scented oil or medicine, owned by an athlete. Size: 2.5" W x 4.25" H (6.4 cm x 10.8 cm); 4.5" H (11.4 cm) on included custom stand. The Archaic period saw a marked change in Greek art, from abstract, geometric forms to a naturalistic style influenced by Egypt and the Near East, here on full display. In ancient times, lions lived in northern Africa and, until the 20th century BCE, in the ancient Near East. The fact that fierce representations are often carved as lionesses, rather than male lions, suggests that Mesopotamian artists had knowledge of the real animal in the wild and knew its hunting habits. 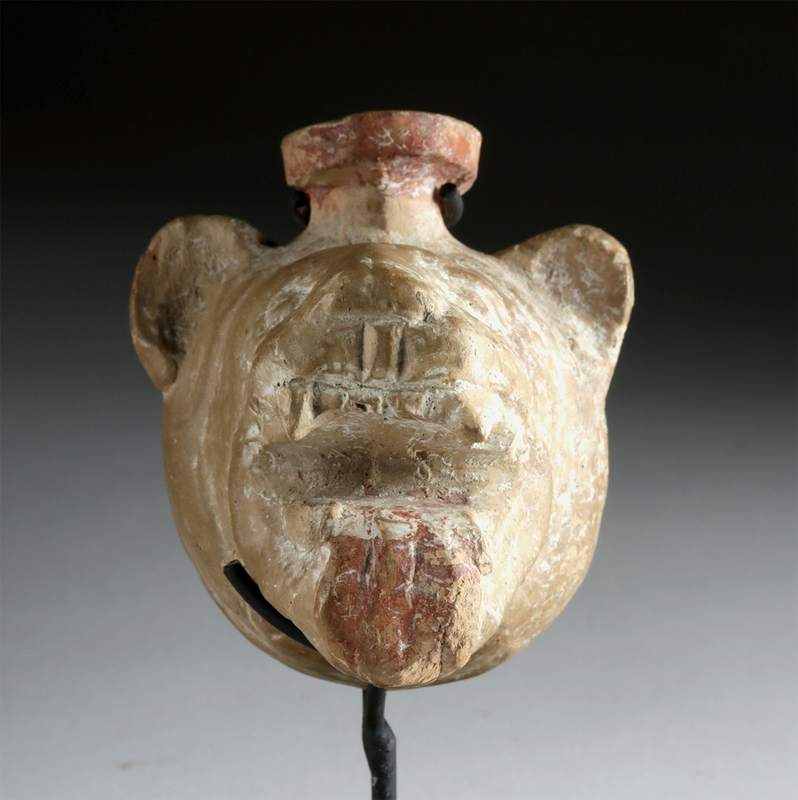 Lions were hunted for sport by the wealthy in this society, and their presence in Mesopotamian iconography is meant to celebrate both man's prowess over nature and the fierce, threatening power of the wild. 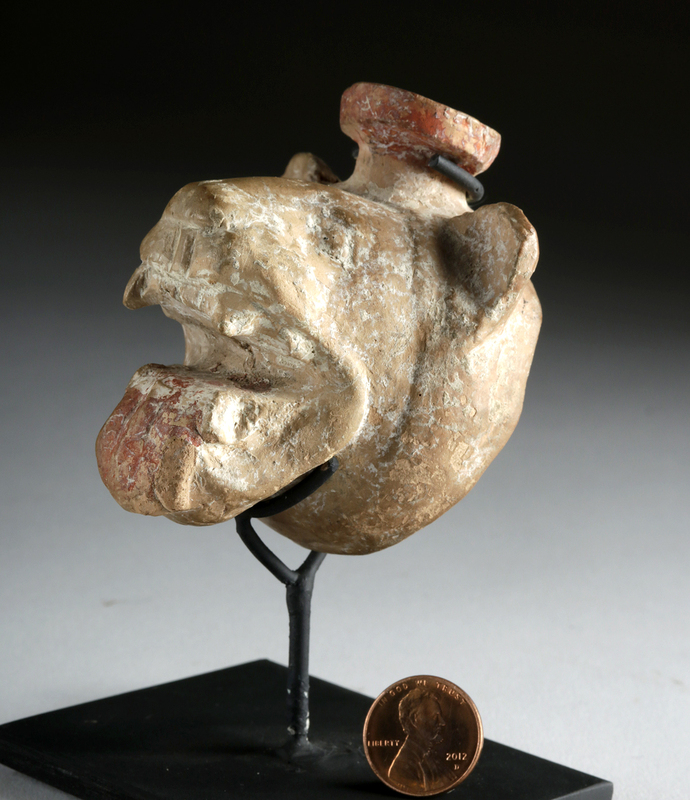 The Greeks who made this vessel were referencing the same ideas - the snarling face of this lioness seems to be emphasizing the latter. Condition: Intact, with deposits on surface. Wear commensurate with age, but overall in excellent condition.